It may bring flashbacks of your middle school hallways, but heed the advice to “walk, don’t run.” No running or rough activities are allowed in pool areas. In addition to other residents, there are potential trip hazards and the surfaces can be slippery-when-wet. Slow down and relax. Proper swimming attire is required at all times, and the use of a cover up when walking to and from the pool area is encouraged. Allow room for others to swim or move around, and keep your belongings close by instead of allowing them to sprawl. This allows others to relax without having to navigate around your towels, lotions, beverages, flip-flops, goggles, reading materials… you get the idea. Residents are encouraged to rinse off before entering the pool and remove any lotions or hair products that can contribute to contamination. 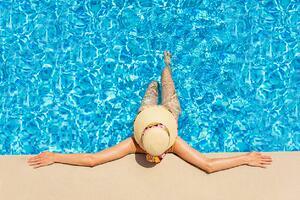 Cover pool furniture with a towel when using suntan oils and be sure to not move the furniture outside the area. Following these rules will help make it a more enjoyable experience for everyone. Be sure to minimize noise, both from loud conversations and electronic devices. It’s ok if you’re into the latest techno music craze, but others may not appreciate the same taste in music. Wear earbuds or keep the tunes at a reasonable level. Additionally — especially when children are around — keep any colorful language at bay. Because many residents bring mobile devices, books and other valuables with them to the pool area, refrain from belly flops, cannonballs and other actions that could splash water in every direction and damage items. Plus, not everyone wants to get wet. Children and pools go together like peanut butter and jelly. Ensure their safety by outfitting them with proper flotation devices, and keep a watchful eye for behavior that crosses the line from being charming to becoming bothersome. Also be sure to keep pool gates closed for the safety of everyone. Before heading to the comforts of home, dispose of any trash and wipe down your chair to remove any lotions or other products so it’s ready for the next person to use. A reminder that glass, pets, or alcoholic beverages are not permitted in the pool area. Use paper or plastic containers only. The pool isn't just for relaxation; it's a great place to meet neighbors and make new friends. How do you prefer to spend your time at the pool? Let us know in the comments!